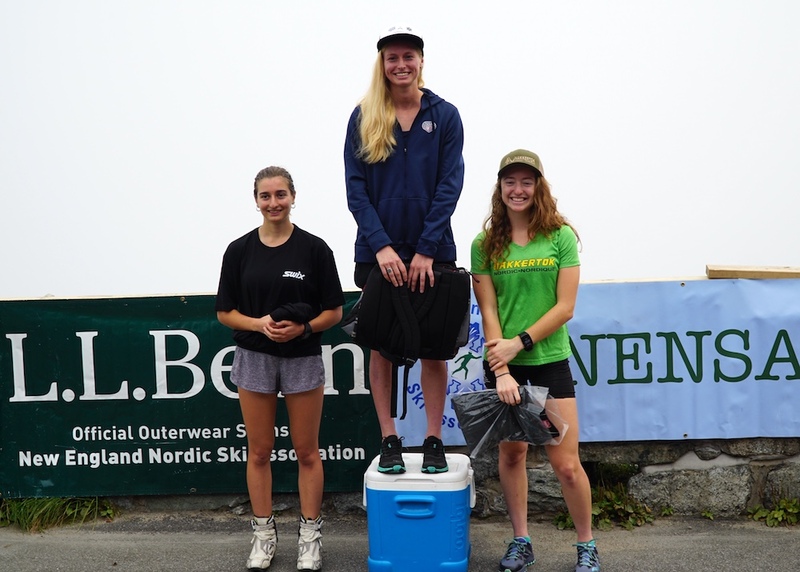 On a humid fall Sunday in northern New York where temperatures reached an uncharacteristic 80 degrees, Jake Brown of the Craftsbury Green Racing Project and US Biathlon Development Team and Tara Geraghty-Moats of USA Nordic won the 2018 Climb to the Castle. Brown’s time was 35:40.7, while Geraghty-Moats finished in 45:03. On the men’s side, Brown’s Craftsbury teammate Raleigh Goessling finished second in 38:16.6, and Erikson Moore of the Fondeurs-Laurentides team in Quebec was third in 39:00.3. Among women, Jackie Garso of Saint Lawrence University was second, in 49:24.1, and Nakkertok’s Zoe Williams third in 49:40.6. This year was a high water mark for attendance, with 102 athletes finishing. 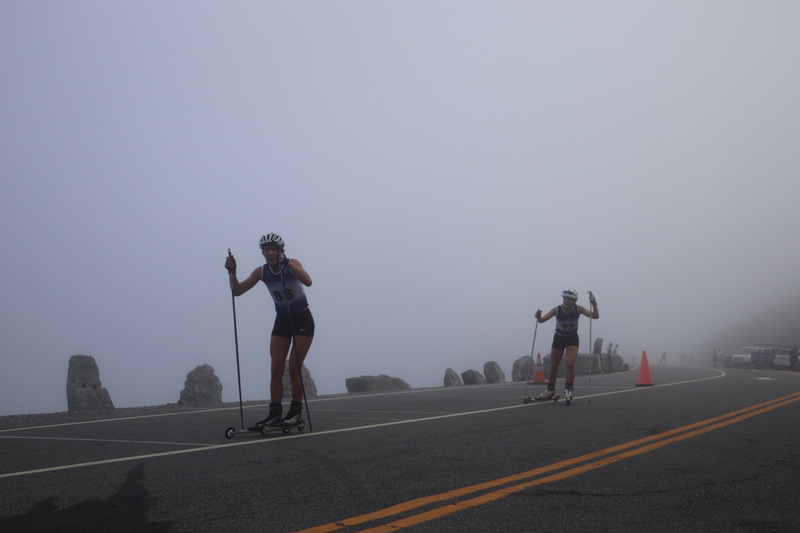 While a few degrees cooler than last year, dank humidity settled like a blanket over the five-mile climb, with athletes moving through a couple of patches of dense fog on the higher reaches of the mountain. This year was Brown’s second consecutive win, and he beat his 2017 time of 39:01.9. A ski jumper winning a cross-country ski competition? For those not in the know, Geraghty-Moats is one of the pioneers of the developing women’s nordic combined. In 2017 she was fourth overall, five seconds behind biathlete Deedra Irwin. 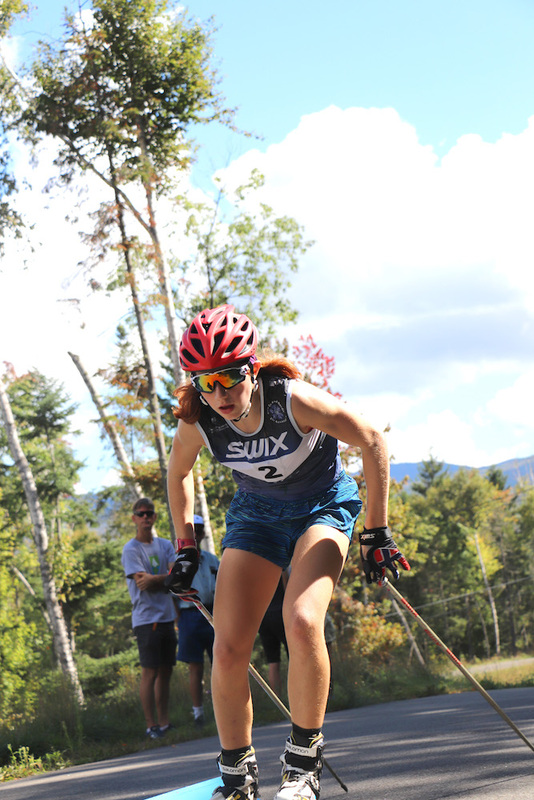 On Saturday, the New England Nordic Ski Association (NENSA) and the New York Ski Education Foundation (NYSEF) collaborated on a new event held on the rollerski loop at the Intervale Ski jumps. The Lake Placid Doubleday started with a three-kilometer prologue; after a break, there was a 1.5 kilometer sprint time trial. The results of the two races were aggregated to determine winners. 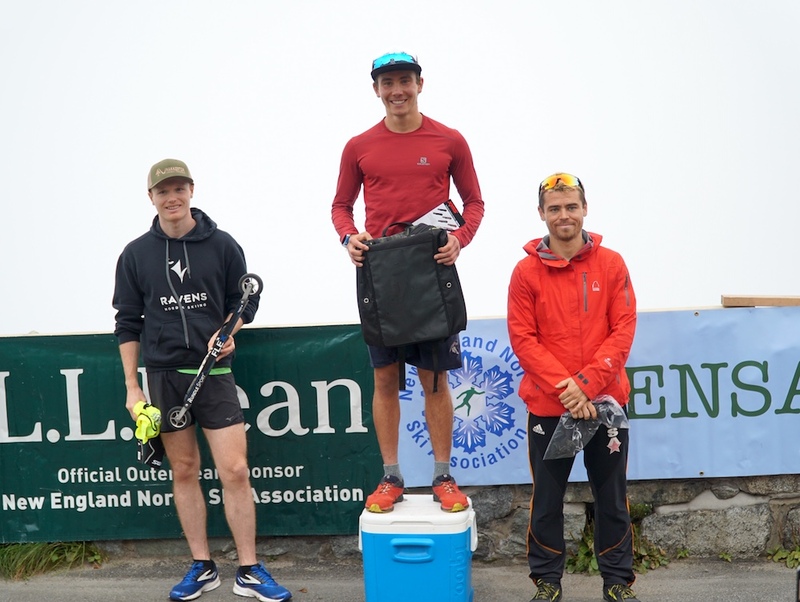 Nicholas Clifford of Carleton University in Ottawa, Ontario, was the open men’s winner, while Nakkertok’s Williams was the open women’s winner before going on to be the runner-up in the Climb to the Castle. The roller ski loop at Intervale is serpentine and narrow, with fast downhills. In the pre-race meeting, Beckwith admonished the athletes to be conservative as they warmed up. As they warmed up, the rollerskiers gradually became more aggressive in their approach to the course. The race started and finished at the biathlon range located midway through the long climb from the lowest to the highest sections of the course. Clifford is the coach of the Carleton University ski team, located in Ottawa, Ontario. Of the Doubleday format, the consensus was that it was tough. But it was also fun, many participants agreed. Amy Duclos of Saint Michael’s College in Burlington VT, was the third overall female finisher at the Doubleday. 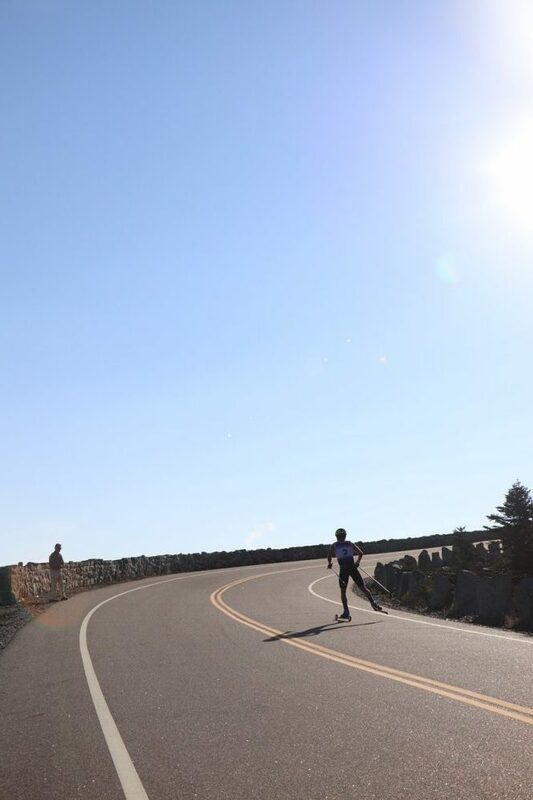 Laura Appleby, of Cambridge Sports Union (CSU), won the junior women’s division at Doubleday and was the fifth junior woman finisher at Climb to the Castle. Shilo Rousseau, Chandra Rousseau, and Zoe Pekos, all of Barrie [Ontario] Cross-Country, sat for an interview in a downtown Lake Placid coffee shop following the Doubleday. Did she save energy for the C2C? Recovering in a bench outside the Castle, a reporter asked the Rousseaus and Pekos, so, did you go full send?